1909 Teddy Bear Replica by Steiff. 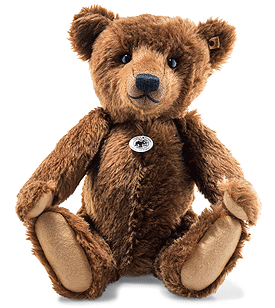 A beautiful limited edition Steiff item, hand made in brown mohair. This very special limited edition piece, has the white ear tag and the trademark Button in Ear - patinated steel, underscored. Worldwide Limited edition of only 909 pieces.